Gorton’s Smart & Crunchy Fish Review And Giveaway! Fine Print: I was given prize pack for review and Gorton’s is giving another to a reader. All opinions and statements below are my own. My kids love fish sticks. My son won’t eat most meat (other than the occasional chicken tender), so I try to incorporate fish sticks whenever I can. We are a fan of Gorton’s in particular and they have come out with a new variety! We have reinvented our iconic Fish Stick, to create the Fish Stick 2.0. 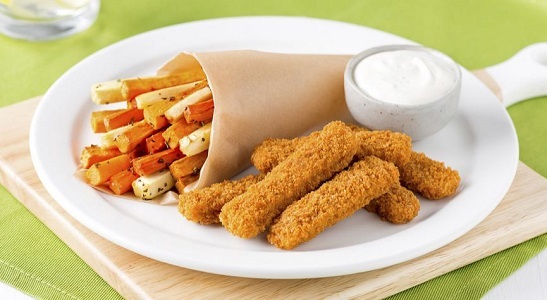 Our all new Smart & Crunchy Fish Sticks and Fillets are made from 100% Alaska Pollock and are never fried, so they have 50% less fat than Gorton’s regular breaded Fish Sticks and Fillets. And, thanks to a seasoned panko crumb, they have the same great taste and crunch you and your family have come to love from Gorton’s. All new Smart & Crunchy Fish Sticks offer a mealtime solution that you can feel great about serving and your family will truly enjoy. 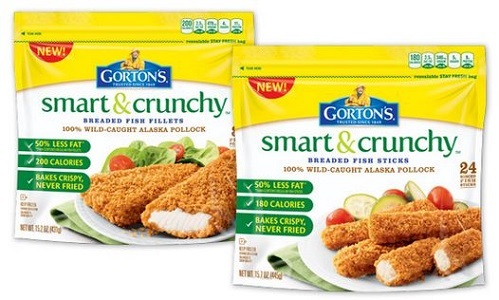 My family and I recently tried the Gorton’s Smart & Crunchy Fish Sticks and Fillets! I made both so that we could try test them out and see what we’d like to buy in the future. We liked them both! I was a little concerned that the outside might get mushy, but it didn’t. I baked them in the oven per the instructions and they turned out beautifully. Crunchy on the outside and flaky on the inside. We liked the taste (I liked the fillets better, but the other “customer” all liked them equally) and I LOVED that I felt like they were getting a healthier option than our usual fish sticks. So this is what we’ll be buying in the future! To learn more about Gorton’s Smart & Crunchy products, sign up for their newsletter here! To get everyone in on the action, I am giving one lucky winner two full-value product coupons, branded Mommy/Daddy and Me Aprons and a Smarty Crunchman plush stuffy! To enter this giveaway, complete any or all of the options listed below. Giveaway ends 6/3. Good luck! I love any kind of seafood! All of the varieties are great. I love their Shrimp Scampi or Talipia Filets also. I like the Crispy Battered Fish Fillets! My favorite product is the popcorn shrimp. We like the beer battered fish filets.